The only edition available that includes all 40 of Warwick Goble's original watercolor-over-ink illustrations, this hardcover collectible is a faithfull facsimile of the classic 1910 Macmillan compilation of Japanese fairy tales. Goble was fascinated by Japanese art, so the Golden Age master is the perfect match for the 38 stories that were collected by Grace James, a noted folklorist and author best known for the John and Mary series. Contents include the title tale as well as "The Good Thunder," "The Star Lovers," "The Wind in the Pine Tree," "The Beautiful Dancer of Yedo," and many others. English writer Grace James (1864-1930) is best known for the John and Mary books, a series of adventure stories for children. 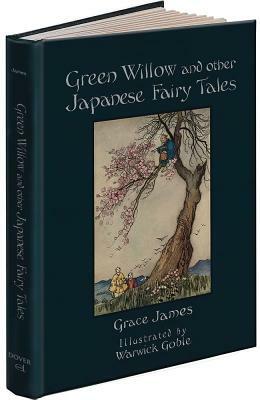 James grew up in Japan and wrote a memoir of her experiences, Japan: Recollections and Impressions, as well as compilations of folklore, including The Moon Maiden and Other Japanese Fairy Tales and The Three Dwarf Trees.Warwick Goble (1862-1943) produced lovely watercolor paintings that perfectly illustrated fairy tale subjects. Specializing in Japanese and Indian themes, he became famous for illustrating both magazines and books. Goble worked as a resident illustrator for Macmillan, where he created dazzling images for The Modern Reader's Chaucer, Treasure Island, Kidnapped, and other classics.